Nestled at the foot of a mountain, Gwaneumsa Temple is dedicated to the Bodhisattva of Compassion and adorned with countless statues, colorful murals, and paper lanterns. The whole area emits an atmosphere of tranquility with its koi ponds, cherry blossoms, ancient cave shrines, and quiet paths sheltered by tall cedar trees. The temple dates back to the period before the 10th century, when Tamra Dynasty ruled the country. Destroyed during the 18th century, when Confucianism was declared the only national religion, the temple was rebuilt in the 20th century. 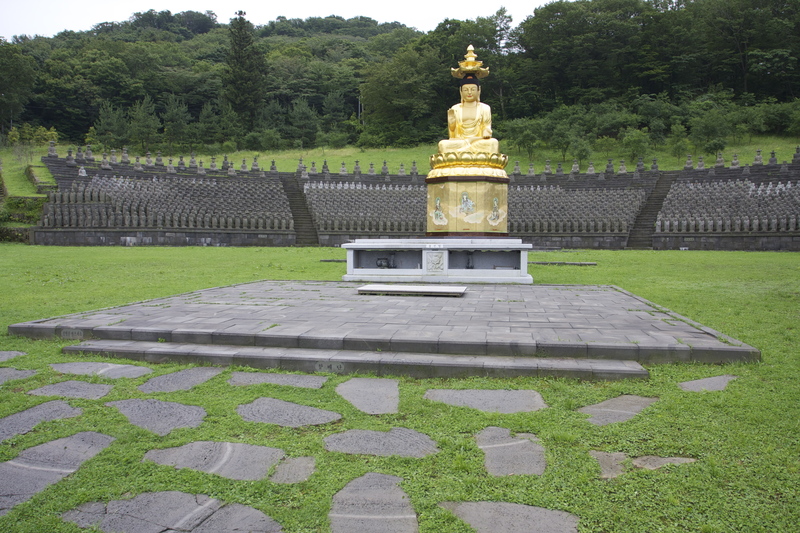 Work out when and for how long to visit Gwaneumsa Temple and other Jeju attractions using our handy Jeju online route planner . Many Buddha images together. A golden big Buddha seems like a fairly new image but no less beautiful. Behind the large Golden Buddha you can find many pictures: really gorgeous!!! Many Buddha statues on the way to the temple! Very special place!